The Station is in the church of Sts. Peter and Marcellinus, two celebrated martyrs of Rome under the persecution of Diocletian. Their relics were brought to the church in 1256, and the church was restored the same year on order from Pope Alexander IV. The first church on the site was built by Pope Siricius in the 4th century, close to the Via Labicana catacombs of Marcellinus and Peter, with an adjoining hospice which became a centre for pilgrims. This church was restored by Pope Gregory III in the 8th century. The church was again restored in 1256, and the martyrs’ relics moved into it, by Pope Alexander IV. (Also under the high altar at present is an urn containing relics of Saint Marcia.) 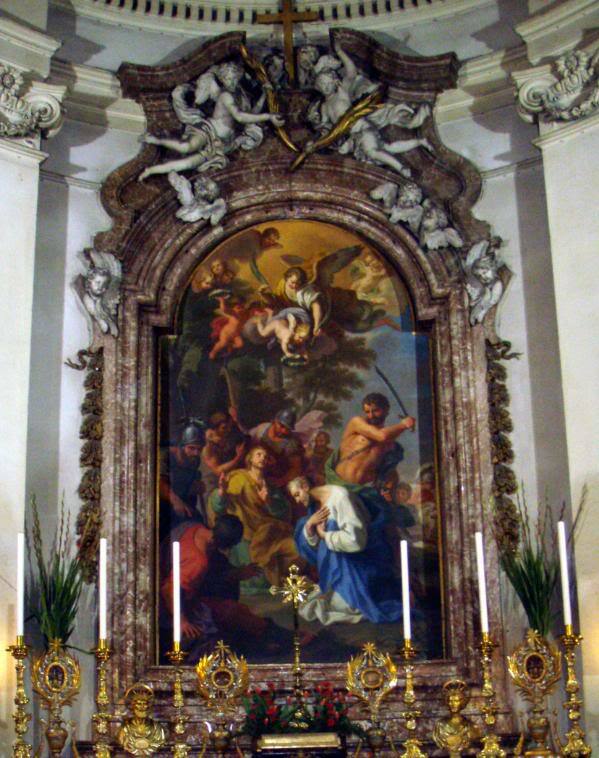 On the left side is an altar dedicated to the Blessed Virgin, with a copy of Guido Reni’s The Virgin in Glory with Angels, St Joseph and St Rita. Next to it is the Chapel of Reconciliation. An image of the dedicatees was placed on the first column on the left from the entrance during this restoration, with an inscription recording the restoration. The hospice and church were then given in 1276 to the Confraternity of those Commended to the Saviour. The present church is the result of Pope Benedict XIV’s 1751 rebuild, leaving it with its present cube-shaped exterior, divided by pilaster strips in a style close to Neo-Classicism, Borromini-influenced dome, façade by Girolamo Theodoli, and altarpiece by Gaetano Lapis depicting the dedicatees’ martyrdom. After that restoration the church was given to the Discalced Carmelites, who served it until 1906. A small chapel to Our Lady of Lourdes was dedicated at the south east (next to a chapel of St Gregory the Great), with a new ceiling painting of her by N. Caselli, in 1903. Since 1911, it has been a parochial church served by diocesan clergy.